To tackle the problem of inconsistent yields in hydroponic farming, we decided to develop a system that would optimize oxidative stress conditions in the growth tanks. Since conventional methods of monitoring and responding to high levels of reactive oxygen species (ROS) are expensive and inefficient, we wanted to design a ROS-level controlling biocircuit centered around a genetically engineered cell that would facilitate detection and response to varying oxidative stress levels in solution. Our solution was an E. coli cell engineered with two novel components: a redox-sensitive fluorescent protein and light-controlled expression of antioxidant proteins. The fluorescent protein’s output signal varies with the ROS concentration in the bacteria’s environment, so the fluorescence can be read and interpreted to determine the oxidative conditions of the growth tank. The light-sensitive promoter can be turned on or off as needed in a non-invasive way to closely control the expression of antioxidant proteins and thus the tank ROS levels. Our bacteria are at the heart of an integrated system that will help farmers monitor and control for a parameter that has not been manipulated to date and which may prove to increase yields across the hydroponics industry. 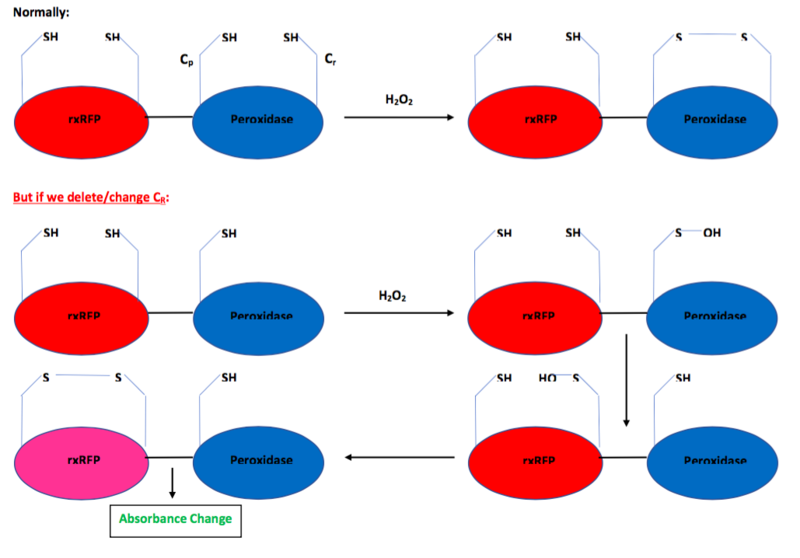 The redox environment of a cell is the balance of reductive and oxidative species in the cell. Fluorescent redox probes like the green fluorescent protein, roGFP have been developed in order to obtain an accurate real-time measurement. 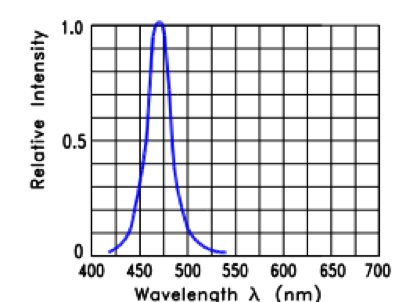 The oxidation of a disulfide bond in roGFP causes a shift in the peak excitation wavelength, allowing a ratiometric reading by comparing emission to excitation at the fully-oxidized and fully-reduced peak wavelengths . Ratiometric results allow the signal to be independent of the amount of probe present and are essential in obtaining an accurate, quantitative reading. To respond to changes in oxidative stress, a probe must have both an oxidized and reduced form that exist in an equilibrium that shifts depending on the oxidative environment (in that sense, redox-sensitive fluorescent probes are analogous to pH-dependent dyes). The roGFP-Orp1 fusion protein satisfies this requirement, making it appropriate for cytosolic and mitochondrial redox level readings. The addition of Orp1--a reactive oxygen species (ROS) scavenger--to roGFP greatly improves the sensitivity of the probe [2,3]. Other fusions with ROS scavengers exist, such as roGFP(iL)-Grx1 which has a higher reducing potential, and roGFP-Tsa2 which has even higher sensitivity than roGFP-Orp1. Our project introduces roGFP2, a variation of roGFP, and rxRFP, a redox-sensitive red fluorescent protein that behaves similarly to roGFP. Redox-sensitive green fluorescent protein (roGFP) is a mutant GFP with two cysteine residues introduced by mutagenesis into the beta-barrel structure. 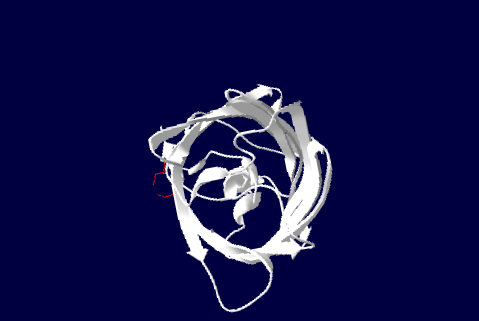 The two cysteines (red) are redox sensors that form a disulfide bridge under oxidizing conditions (left, PDB 1JC1). This leads to a subtle change in the barrel structure and its absorption spectrum compared to the reduced form (right, PDB 1JC0). Our initial approach to studying cellular redox processes was to use roGFP2 to signal to the external optics system. roGFP2 is a redox-sensitive green fluorescent protein that displays characterizable peaks at 400 nm and 488 nm in its excitation spectra, whose intensities change between the oxidized and reduced states. The external LED system was then used to signal optogenetic plasmids, pDawn and pDusk, which control for gene expression. The complication with this approach is that the pDawn and pDusk are regulated by light of wavelength 470 nm. Due to overlap in the excitation spectra of roGFP2 and those of pDawn and pDusk, we opted for an alternative fluorescent protein. rxRFP is a red, redox-sensitive fluorescent protein which has excitation spectra with peaks at higher wavelengths for both oxidized and reduced states, so they do not interfere with the pDawn and pDusk pathways [4,5]. Our fluorescent protein constructs were fused to yeast peroxidases to enhance sensitivity. The yeast peroxidase Orp1, in response to oxidative stress, activates the YAP1 transcription factor to promote the expression of stress response pathways. A peroxidatic cysteine (CP) acts as the sensor, while the resolving cysteine (CR) acts to form a disulfide bridge [6,7]. 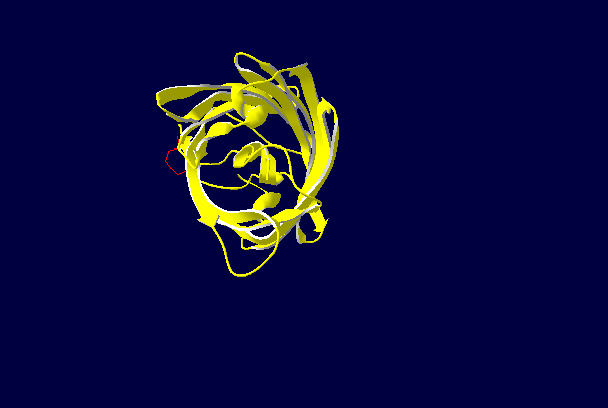 The Tsa2 yeast peroxidase functions similarly to Orp1, but the resolving cysteine has been deleted to promote the transfer of sulfenic acid to the fluorescent protein. Similarly, we mutated the resolving cysteine of Orp1 to serine for the same purpose. 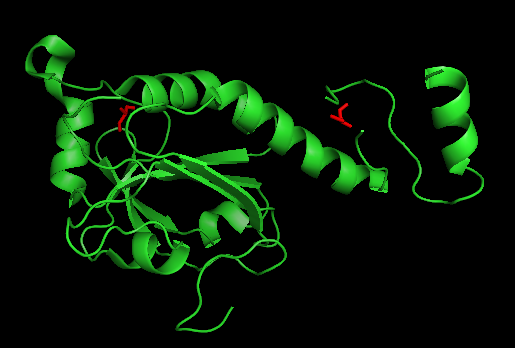 The yeast peroxidase Tsa2 has two cysteine residues (red) that respond to reactive oxygen species in the environment (PDB 5DVB). Optogenetics is a biological technique utilizing light to control cells, typically by genetic regulation. In many organisms, particularly plants, the response to light is crucial for an energetic reaction such as photosynthesis. Phytochromes are proteins central to the plant sensing and response to light and are involved in plant growth and development. Besides phytochromes, plants have a myriad of light-sensitive proteins, many of which can be harnessed with synthetic biology to create optogenetic (light-regulated) circuits . Gene expression that is responsive to light is a versatile effector in the genetic toolkit. In particular, the pDawn/pDusk light activated promoter system features low background noise, ease of use, and reversibility in control of gene expression . Gene expression can be made to be responsive to light with the pDawn and pDusk one-system plasmids. These systems are able to respond with incredible spatial and temporal precision to blue light. In addition, these plasmids are noninvasive and employ bacterial components already present in E.coli. 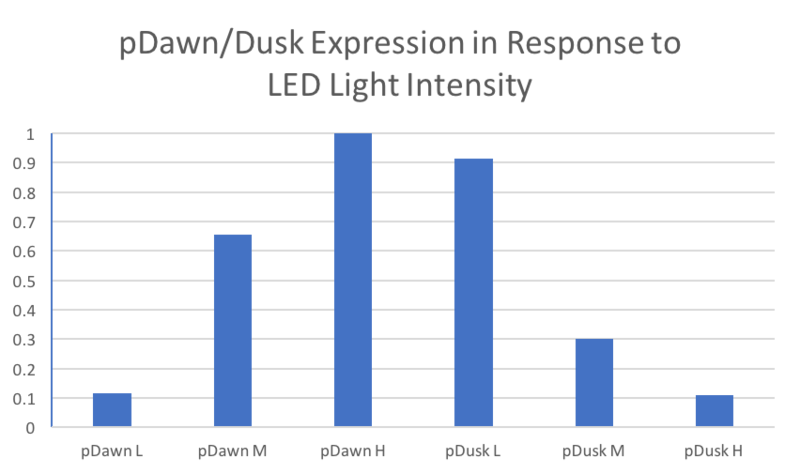 When exposed to blue light, pDusk represses the gene it controls, whereas pDawn reverses the signal polarity of pDusk by employing an additional component to its circuitry. Oxyponics necessarily features optogenetic expression of effectors that can regulate environmental ROS. It is crucial for the function of our project because it allows the oxyponics hardware to directly activate gene expression by light, relaying the oxidative stress levels reported by redox-sensitive fluorescent proteins. In order to target the optimal level of oxidative stress for plant growth, our platform uses redox-sensitive fluorescent proteins as a reporter to couple an external optics system to an intracellular optogenetic transcriptional circuit. Our team assembled two plasmids that allow for light-sensitive gene expression. The pDusk construct allows for transcription in the absence of light. This system takes advantage of the YF1 and FixJ. YF1 is a histidine kinase that, in the absence of blue light, phosphorylates the regulator FixJ, which proceeds to enhance the expression of genes downstream of the FixK2 promoter. The pDawn system adds onto the pDusk system by incorporating the lambda repressor downstream of the FixK2 promoter. This repressor exerts an inhibitory effect on the transcription of genes downstream of the pR promoter. We have a panel of FLAG-tagged enzymes whose expressions are regulated by pDawn and pDusk. These enzymes include superoxide dismutase, 2-nitropropane dioxygenase, glutathione-independent formaldehyde dehydrogenase, hydrazinase, L-asparaginase 2, and NADPH-dehydrogenase. These enzymes break down many of the harmful chemicals that trigger the formation of reactive oxygen species [10,11]. Our system was designed with the future in mind. 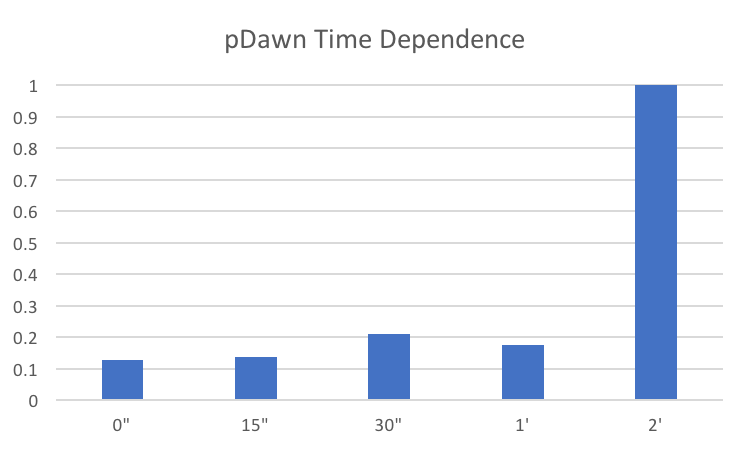 The pDawn/pDusk system gives researchers the power to arbitrarily modify any environmental parameter. Our initial brainstorming session also indicated that our system could be applied to water improvement, soil quality, and remediation, as heavy metals can induce oxidative stress in bacteria. Although our hydroponic system is safe and there are mechanisms to contain the E. coli, some of the farmers we spoke with mentioned concerns over the use of bacteria. Therefore, another key area for future development, specifically within the scope of hydroponics and agriculture, would be to adapt our fluorescent protein genetic constructs into different expression systems, such as those for yeast (S. cerevisiae) or other naturally-occurring symbiotic bacteria that lack the stigma associated with E. coli in food production. Furthermore, we found that there exist potential applications of an oxidative stress sensor in brewing, to which yeast that can report on the environmental redox state can prove to be extremely useful and acceptable. Fundamentally, our construct can be used to make hardier bacteria for both aerobic and anaerobic cultures. As a result, engineered bacterial circuits can allow bacteria to survive in unprecedented high-stress laboratory conditions. Our construct will also be foundational to modifying plant and other eukaryotic cells to be more resistant to oxidative stress. Cannon, M. B., & Remington, S. J. (2006). Re-engineering redox-sensitive green fluorescent protein for improved response rate. Protein Science, 15(1), 45-57. Retrieved from https://www.ncbi.nlm.nih.gov/pmc/articles/PMC2242357/. Delaunay, A., Pflieger, D., Barrault, M., Vinh, J., Toledano, M.B. (2002). A Thiol Peroxidase is an H2O2 Receptor and Redox-Transducer in Gene Activation. Cell, 111: 471- 481. Ren, W., Ai, H. (2013). Genetically Encoded Fluorescent Redox Probes. Sensors, 13: 15422-15433. Tabor, J.J., Levskaya, A., Voigt, C.A. (2011). Multichromatic control of gene expression in Escherichia coli. J Mol Biol 405(2): 315-324. Ohlendorf, R., Vidavski, R. R., Eldar, A., Moffat, K., & Moglich, A. (2012). From Dusk till Dawn: One-Plasmid Systems for Light-Regulated Gene Expression. Journal of Molecular Biology, 416, 534-542. Birben, E., Sahiner, U.M., Sackesen, C., Erzurum, S., Kalayci, O. (2012). Oxidative Stress and Antioxidant Defense. WAO Journal, 9-19. Mukhopadhyay, S., Schellhorn, H.E. (1997). Identification and Characterization of Hydrogen Peroxide-Sensitive Mutants of Escherichia coli: Genes That Require OxyR for Expression. Journal of Bacteriology, 179(2): 330-338.